Beautiful Puerto Vallarta Mansions. I know you will love these houses. I haven't seen anything this beautiful in Puerto Vallarta, or anywhere else for that matter. You will find them all the way on top of the luxurious and exclusive Conchas Chinas hillside in a cul de sac called "Media Luna", with an unobstructed, gorgeous view of the bay and the Mexican coastline. There are three gorgeous villas with the same floor plan perched on a magnificent cliff with incredible views of the bay and the jungle. Each villas is facing in a little different direction to assure privacy. I know you will love these houses. They are Exquisite. Each house is almost 4,000 square feet set in four levels. Each includes three huge bedrooms suites with adjoining semi-open air bathrooms, each vying for the most dramatic and magnificent view. The Spanish-Moorish architecture is majestic and dramatic. Each villa has its own private swimming pool and maid's quarters. They are in a small gated grouping of six houses. These three villas are in front of the other houses on a cliff. 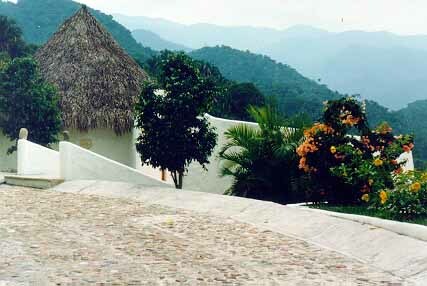 And these houses were especially constructed to provide the maximum in privacy and tranquility. The houses are virtually the same except for tile color, decorations and furnishings. The furnishings pictured are mine and are not included in the sale. The villas are priced at $875,000 and $575,000 (needs substantial repairs).